This package deal includes Amharic 101, Amharic 102, Amharic 103 and Amharic 104. You will save $120 USD (over 50%) by buying the four programs as a package deal compared to buying each program separately. Please see the product description below. This package deal contains Amharic 101-104, which are the four volumes of the Amharic multimedia tutorial series. 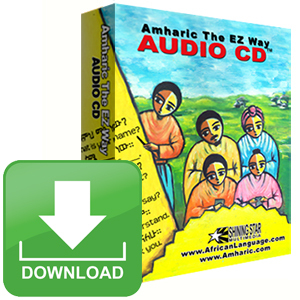 With the digital download version, you will be able to download the programs and start your Amharic within minutes. You will also save an additional $10 (compared to the CD version) and there is no shipping charges. You will learn and master the Amharic Alphabet. We developed a unique way of learning the alphabets that uses phonics, images, simple rules, audio clips, games, and quizzes. There are a large number of letters in Amharic, and we will learn them in a very short time period. You will learn new vocabulary words in preparation for the upcoming lessons. Each lesson builds on what we learned in the previous lesson. Once we know our Amharic alphabet and some vocabulary words, we will learn how to read in Amharic. We will use audio and video clips to guide us in this section. Each program has a section called “Quick Fix”. You will learn important and often used phrases in this section. From simple greetings to asking various questions. You can memorize these phrases and use them right away to converse in Amharic. 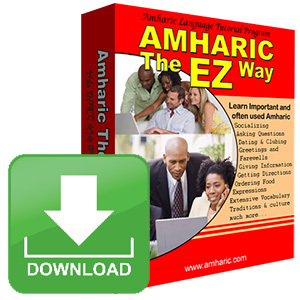 If you objective is to learn Amharic phrases only, please see our Amharic The EZ Way program. There are fun and simple games that are based on the lessons found in this section. This will help reinforce all that we have learned. You will be timed and scored on your performance so that you can continuouslychallengeyourself to do better. This is a proven and fun way of learning any foreign language. Last but not least, there are quizzes that will test your skill before you move on to the next level. There are multiple choice, matching, true/false, fill in the blank type quizzes. You will be graded at the end of each quiz. A certificatewith your grade can be printed out so that you can keep track of your improvement. There are also extra material such as: Brief Ethiopian History, Ethiopian History Time Line, back ground information on the Amharic language and Ethiopia in general. This program will focus on writing in Amharic and introduces sentence construction. Printed and Written Amharic are not always the same in Amharic. This section will teach you how to write Amharic. We use the beautiful scripts of a native Ethiopian person to teach you the proper way of writing (see Demo for an example). We will learn a great deal of new verbs and other vocabulary words in preparation for sentence construction. We will learn a great deal of material on Amharic Verbs. This includes the difference between regular and irregular verbs, relationship between verbs that start with ‘mu’ Vs. ‘ma’, importance of verb roots, suffix, and prefix, and more. You will learn verb conjugation in the present tense. 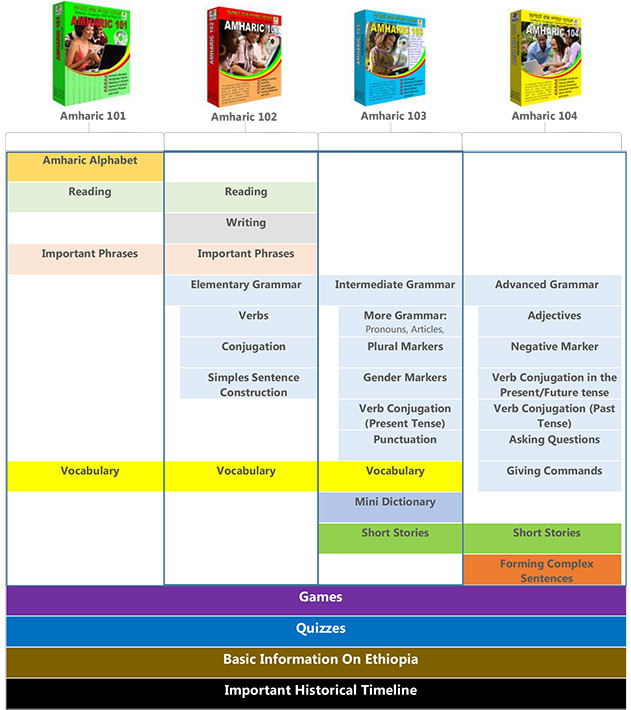 We have developed rules of conjugation over the past ten years with the help of educators from Ethiopia and USA that is unique and only found in our programs. This section will spend a great deal of time teaching you these rules. This program will focus on expanding your vocabulary and sentence formation. There is a whole lesson dedicated to teaching you various vocabulary words. The categories include: colors, numbers, calendar, various professions names of domestic and wild animals, family structure, house items (including objects found in various rooms of a home), men and women clothing, human anatomy, car parts, and food in general. We are now ready to start putting together more complex sentences. Therefore, we will need to learn Amharic punctuation and study sentence formation in detail. Similar to the gender marker, there are other markers such as the plural marker that we will learn in this lesson. We will continue to learn more grammar in this section. This will enable us to form more complex sentences in the upcoming lessons. Now that we have learned the Amharic alphabet, reading, grammar, verb conjugation in the present tense, and expanded our vocabulary base, we are ready to start reading short stories in Amharic. These stories are simple to follow with English translation at your finger tips. The Short Stories in Amharic 104 will be more complex and difficult in comparison. Amharic 103 has a mini dictionary that covers important and often used words. This program will focus on advanced grammar, forming complex positive and negative sentences asking questions, giving orders, and short stories. We will learn verb conjugation in the future tense so that we can form affirmative and negative sentences in the future tense. Since we have already learned verb conjugation in the present tense, this section will be very easy and straight forward. There are a lot of examples available. We will next learn verb conjugation in the past tense. Once we complete this section, we will be able to form sentences in all tenses. The negative marker is a bit tricky to explain in few sentences. However we have an entire section dedicated to this topic. We will learn the rules and view numerous examples. Similar to the above two sections, there are many examples and explanations available. We will learn to form complex questions and giving orders in Amharic. We build on what we have learned this far. We will continuously learn grammar since this is a more advanced section. Adjectives will be covered in this section along other advanced topics. This is where everything comes together. All that we have learned in the past lessons were preparation for this and the following section. By this point we will have learned all the basic tools we need to start reading, writing, and composing complex sentences of all sorts. Since we have learned all the basics, the short stories in this section will be easy to follow. There is still English translation and help available for the words that we don’t understand.